SKY NEWS interviewed me and other guests on the issue of the UK government putting pressure on the Muslim community to turn in youth to the police, if they express a desire to go to Syria to help fight against the brutal Secular dictator, Bashar al Assad. I am against this government project, and believe that it is up to the individual conscience of Muslims and their own families to make up their own minds whether they should go to Syria or not in light of the facts and after being warned of the dangers, and not be bullied or threatened by their own government. Individual Muslims must not be treated as terrorists for following their conscience especially considering that other people in the past have done so in similar circumstances, and were met with silent approval from the very same UK government. The beliefs of the Syrian rebels should not criminalise their cause, only criminal methods renders someone a criminal. Terrorism means to deliberately kill civilians and is not allowed in Islam, and all acts of terrorism must be condemned. But if merely going to fight overseas is condemned as Terrorism, shouldn’t the UK arrest british volunteers joining the Israeli Defence Force which killed civilians in Gaza in a war against the Gazan government? Additionally I raised another point on the hypocrisy of the British government to declare that going to fight in Syria is an act of Terrorism – especially considering many many cases in the past where the UK were perfectly happy for people to go and fight (Libyan revolution, Afghan war against soviets, Kosovan war etc etc). The show was pre-recorded. The 3 min video is highly edited and shows only a few snippets of the discussion, but the article quotes my points extensively. Sky News published the video along with written excerpts from my interview on this website, this was reposted by yahoo news. The video and the article have been reposted below for your convenience. Muslim leaders tell Sky News the Government’s legal stance on Britons fighting abroad could “increase the terror risk” to the UK. Muslim leaders in the UK have warned against laws that automatically brand British fighters in Syria as terrorists. It comes as Home Secretary Theresa May launches a campaign today to discourage young men from going to fight in Syria and Iraq. A short film will focus on the distress it can cause their families. But some in the Muslim community have told Sky News the Government’s legal stance on fighting abroad could “increase the risk” to the UK. 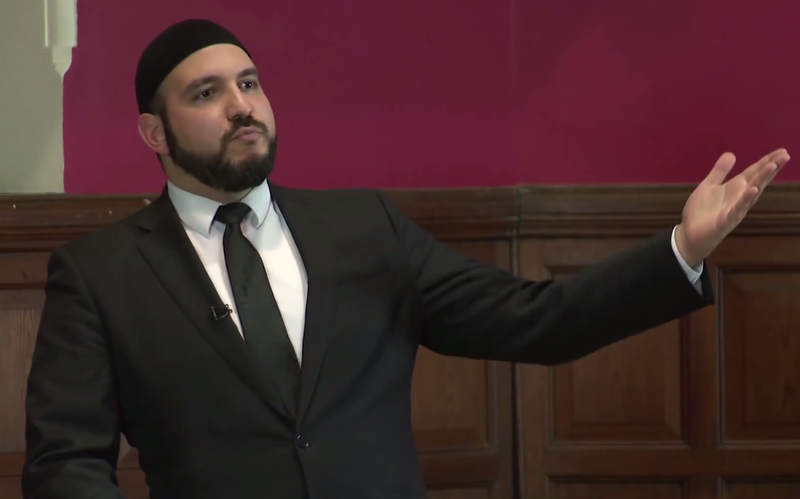 Abdullah al Andalusi, a senior researcher at the Muslim Debate Initiative, said: “It’s hypocritical of the UK Government to expect Muslims not to go, if they feel they want to fight in a just war. “Bertrand Russell, George Orwell – they went to the Spanish civil war, people were going to fight Gaddafi in Libya and that was all fine. He added: “Obviously there are some terrorist groups in Syria and Iraq but if we start punishing everybody it only adds a grievance which actually increases the risk (to the UK). In the late 1930s, British nationals fought against a fascist rebellion in Spain – and under today’s laws they would probably be classed as terrorists. The 2006 Terrorism Act stipulates that weapons training and fighting in rebel groups against the foreign state can be treated as if acts of terror in the UK. The Government is seeking to strengthen this law with its Serious Crime Bill. Some British fighters in Syria have argued they are only acting where the West failed to act following President Bashar al Assad’s alleged use of chemical weapons on his own people. Security Minister James Brokenshire told Sky News: “I understand that people want to assist but the point is that by doing so they may put their own lives at risk because of the situation on the ground, and put themselves at risk of exploitation by extremist and terrorist groups such as the Al Nusra Front and ISIS. With so many groups in Syria fighting each other, the Government warns that Brits who think they may be joining a battle against the Assad regime are being sucked into a quite different ideological battle controlled by terrorist groups. The Muslim community is also united in warning people not to go. as salaam alaikum, Maybe it didn’t make the final cut but I’m rather shocked that you didn’t bring up the fact that there are UK citizens fighting in the IDF who are not being prosecuted at all, despite the IDF’s known violations of the Geneva Convention. I did mention UK not prosecuting citizens joining the IDF as another hypocrisy, but you’re right, it didn’t make the final cut.